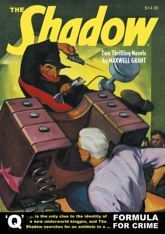 The Knight of Darkness hunts hidden crime lords in two thrilling mysteries by Walter B. Gibson, writing as "Maxwell Grant." First, the only clue to the deadly crime wave engulfing Manhattan is a single wireless message typed out in Morse Code: "Q." Then, a brilliant mathematician invents a system to chart future crimes. Can The Shadow use the "Formula for Crime" to solve the mysterious "X" and unmask a criminal mastermind? Bonus: "Lightning Strikes Twice," a thrilling Whisperer adventure by Alan Hathway, writing as "Clifford Goodrich." Plus, Iron Munro returns in a Golden Age of Comics classic by Otto Binder and Elmer C. Stoner. This instant collector's item features both classic color pulp covers by George Rozen and Graves Gladney and the original interior illustrations by Earl Mayan and Paul Orban, with original commentary by popular culture historian Will Murray.